The Adventure Consultants Mount Elbrus Trip 2 Expedition features a night in Moscow upon arrival into the country and an efficient departure from Russia a couple of days after summiting Elbrus. On completion of the acclimatisation hikes and climbs, we ascend Elbrus from the Baksan Valley before taking a short drive to Mineralnye Vody International airport to depart. 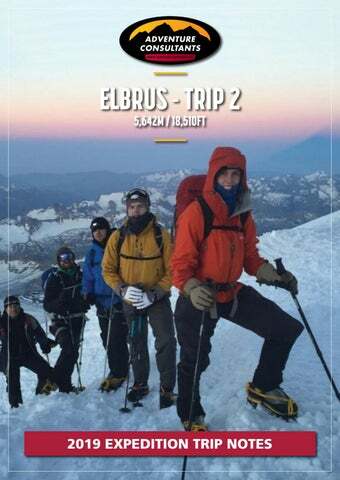 ELBRUS OPTIONS Adventure Consultants offers three options for climbing Elbrus. Trip 1 is 14 days in duration and starts in St Petersburg and finishes in Moscow. Trip 2 is 11 days and starts in Moscow and finishes in Mineralnye Vody and Trip 3 is 10 days and starts and finishes in Mineralnye Vody. These notes outline information relevant to Trip 2. Please see our website for further information on Trips 1 and 3. Baksan Valley and partake in daily acclimatisation hikes with good food and pleasant surroundings to help us enjoy the region. After several days we move into the high mountain huts for more training followed by the ascent itself. We have included contingency days to allow for inclement weather and our proven ascent program assures a very high chance of success. We stay in hotels and comfortable mountain lodges to avoid the need for tents so you can simply bring along a sleeping bag and your climbing gear and enjoy the climb! Attaining a relatively high elevation at 5,642m or 18,506 feet, Elbrus certainly demands respect for its altitude and we deliberately focus on climbing high each day and sleeping low to facilitate effective acclimatisation. Once the climb is finished we’ll return to the valley floor for celebrations, and then return to Mineralnye Vody. Elbrus’ shadow breaks across the Caucasus at dawn. Photo: Mike Roberts. As with any foray to high altitude, it is imperative that expedition members are fit and strong and in good health. 4WD outing to a local waterfall (2,700m/ 8,850ft), acclimatisation hike to Ice Camp (3,700m/12,100ft). Return to the hotel. Ride ski lifts for an acclimatisation hike. Overnight stay in the newly renovated Heart of Elbrus Hut (3,900m/12,800ft) on the slopes of Elbrus. Acclimatisation hike to the Obelisk (4,100m/13,450ft), return to the hut. Acclimatisation hike to Pastukhov Rocks (4,600m/15,100ft), return to the hut. Summit day. Leave the hut about 3am for the climb of Elbrus’ west summit (5,642m/18,510ft). Overnight in the hut. Reserve day for climbing Elbrus. Overnight in the hut. Drive to Mineralnye Vody, trip ends, depart for home. The skills necessary for the climb are relatively straightforward, with the initial 1,000m/3,300ft involving moderate snow climbing of 20–30 degrees. Higher up, the slope steepens to 35 degrees in spots and can be icy if the wind has scoured the upper mountain, so good crampon technique is important. We do recommend that you join an introductory mountaineering instruction course prior to the expedition, but it is not essential, as there are opportunities to practice and review the requisite snowcraft skills prior to the final ascent, which makes an ascent of Elbrus a great option for any fit mountain enthusiast. TEAM SIZE The team will have a minimum size of 6 members and 2 guides and a maximum size of 12 members and 3 guides. Arrive Moscow, Russia. Team meeting, welcome dinner and gear check. 2-hour flight to Mineralnye Vody (Caucasus). 3-hour bus ride to a hotel in the Baksan Valley. Overnight stay in hotel. Acclimatisation ascent (using ski lifts) of Cheget Mountain (3,600m/11,800ft). Overnight stay in the hotel. NOTE: We have a longer 14-day Elbrus ascent starting in St Petersburg and finishing in Moscow, which includes sightseeing in both cities. See our Elbrus Trip 1, July, 8–21, 2019. We also have a shorter 10-day Elbrus Trip 3 initiating and concluding in Mineralnye Vody August 10–19 2019.
in every expedition to offer our climbers the best possible chance of success. FOOD Food will be of the highest standard possible, given the remoteness of the situation. If you have any special dietary requirements, please advise us at the time of registration. For special diets such as vegan and gluten/dairy free, we will call you to discuss your needs and how this will work on the expedition in Russia. Expedition members will need to provide 3 passport photographs for the permit and a photocopy of their passport biodata page. VISAS Almost all foreign travellers to Russia require a visa. The process begins at the balance payment date for your expedition, when your trip has been paid for and confirmed and we have received your flight details. We will then be able to provide an invitation letter and the support documentation necessary to procure your Russian visa. The visa process normally takes about 4 weeks, although it has been known to take up to 10 weeks. You can begin the visa process up to 3 months in advance so we advise that you submit your application as soon as you have received the relevant documentation from our office. Please note that you will need to send your passport to your nearest Russian embassy along with the necessary paperwork. Your travel agent or a visa processing service should be able to assist you with this process. EQUIPMENT Adventure Consultants will supply all group gear (e.g., ropes, stoves, food) whilst expedition members are to provide their own personal clothing and equipment. A comprehensive equipment list will be provided to expedition members upon confirmation of your participation. COMMUNICATIONS & INSURANCE To safeguard members of the expedition we will be carrying a satellite telephone. We require expedition members to carry additional insurance for evacuation and repatriation as well as normal travel medical expenses. Contact us for expedition insurance advice. PAYMENT DETAILS All payments should be made by bank transfer to the following bank and account: Bank of New Zealand Offshore Branch 1 Willis Street Wellington New Zealand For the account of Adventure Consultants Limited Swift Address: BKNZNZ22 Account Number: 1000-594771-0002 Beneficiary’s Account Name: Adventure Consultants Limited Beneficiary’s Address: 20 Brownston Street, Wanaka 9305, New Zealand Account Type: Euro NOTE: All bank transfer charges are for the remitter’s account. We can also accept your deposit and balance payment by credit card (Visa, Mastercard and Amex) plus a 3% card charge. DEPOSIT A non-refundable deposit of €500 is payable to secure a place on the expedition. BALANCE The balance of €3,800 is payable 90 days prior to trip start date. CANCELLATION & REFUND POLICY An expedition member may then cancel their participation on the following basis: a)	Cancellations outside of 90 days will result in the loss of the trip deposit. b)	For cancellations made within 89–60 days of the trip commencement date, we reserve the right to retain 50% of the balance payment fee. c)	For cancellations within 59 days of the departure date, a cancellation fee of 100% of the full fee applies. We strongly recommend you take out trip cancellation insurance via your travel agent if you wish to be covered against cancellation due to medical or personal reasons. Adventure Consultants is affiliated to the New Zealand Mountain Guides Association (NZMGA), New Zealand Alpine Club (NZAC) and a corporate member of the American Alpine Club (AAC). Adventure Consultants is a supporter of the dZi Foundation in Nepal for their ‘Revitalise a Village’ programmes. 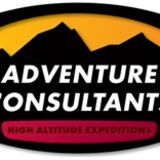 Adventure Consultants perform to IFMGA/UIAGM standards and are world leaders in high altitude guiding.